The CWP Hanging Basket Drip Pan collects water overflow from your hanging pots and baskets, keeping the floor of your porch, sunroom, balcony, or any other area free of stain and mildew-causing muddy water. These drip pans feature four molded built-in hooks that keep them securely fastened underneath your hanging pots or baskets. This allows for greater stability and a reduced chance of drips, spills, and mishaps. They attach quickly and easily for a hassle-free solution to typical hanging plant mess. They're perfect for indoor and outdoor use and are eco-friendly because the excess water keeps your plan moist and hydrated. CWP's Hanging Basket Drip Pans are made from clear PVP plastic. This means they're sturdy enough to hold water and sway in the wind without breaking, and they won't detract from the natural, earthy beauty of your pots and baskets. This 5-pack offers a generous supply of handy drip pans that is sure to last many seasons. Get yours today! PREVENT OVERFLOW WHILE WATERING - The CWP Hanging Basket Drip Pan collects water overflow from your hanging pots and baskets, keeping the floor of your porch, sunroom, balcony, or any other area free of stain and mildew-causing muddy water. This 5-pack combines functionality and elegance, allowing users to enhance the look of their floral masterpieces without the distraction of unwanted color. Perfect for both indoor and outdoor use. 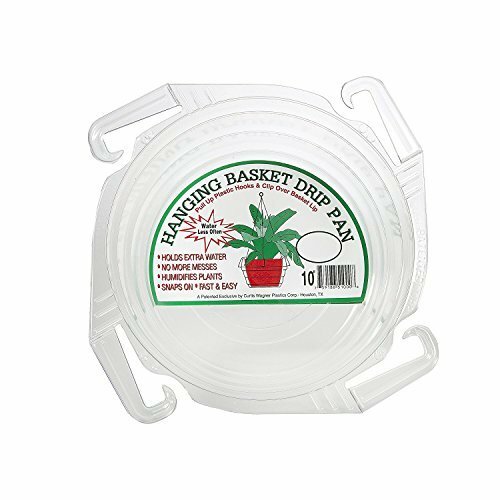 FAST & EASY SNAPS FOR HANGING BASKETS - These drip pans feature four molded built-in hooks that keep them securely fastened underneath your hanging pots or baskets. This allows for greater stability and a reduced chance of drips, spills, and mishaps. They attach quickly and easily for a hassle-free solution to typical hanging plant mess. KEEPS PLANT MOIST INSIDE AND OUT - Drainage and hydration are both critical for potted plants. Our durable drip pans allow for drainage but, by holding excess water outside the pot, keep plants healthy and moist. You can also use them as watering devices; simply fill full of water and watch as your plant slowly absorbs the water it need. Very effective in hot and dry climates. SAFE AND CLEAR PVC PLASTIC - Curtis Wagner Plastics uses thicker and sturdier PVC plastic to construct its products, ensuring that they last longer and work better for end users. This means our Drip Pans are sturdy enough to hold water and sway in the wind without breaking and will not detract from the natural, earthy beauty of your pots and baskets. PRODUCT SPECIFICATIONS - Package includes (5) Curtis Wagner Plastics 10 Inch Clear Hanging Basket Drip Pan Saucers. Drip pans have a 9" diameter on top, a 3 1/2" depth, and a 7 3/8" diameter on bottom. Brand: Curtis Wagner Plastics Corp. If you have any questions about this product by Curtis Wagner Plastics Corp., contact us by completing and submitting the form below. If you are looking for a specif part number, please include it with your message.